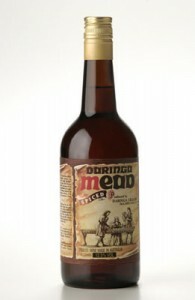 Mead is one of the oldest beverages known to man. In Greek Mythology it was known as Ambrosia “The Nectar of the Gods”. Because of its legendary qualities as an aphrodisiac it became known as the honey moon drink. It is naturally fermented from Australian honey and does not contain any added alcohol. MULLING: The recipe contains a special selection of spices, which make mead ideal for mulling. A popular practice in coaching inns of Olde-England, a red hot poker from the open fire was plunged into a tankard of mead to heat it, to warm the cockles of the hearts of weary travelers. Today, an “electronic hot poker” in the form of the microwave oven can be used to “mull” mead. Simply heat a glass of mead in a microwave for a few seconds, sip and think of merry old England. Do not boil or the alcohol will be lost. IN SUMMER: Mead served chilled over plenty of ice as a mixer, with soda or lemonade, sliced cucumber and lemon and if you feel like it, a nip of your favourite spirit makes for a refreshingly different thirst quencher. TRY THIS: In a tall Glass with lots of ice, half fill with mead, add 1/2 measure( 15ml) of vanilla Galliano, top the glass with ginger ale, gently stir ( stirred not shaken!!) We call this the Cold Cross Bun.